Celebrate the holidays with our Christmas Cranberry Layer Cake! 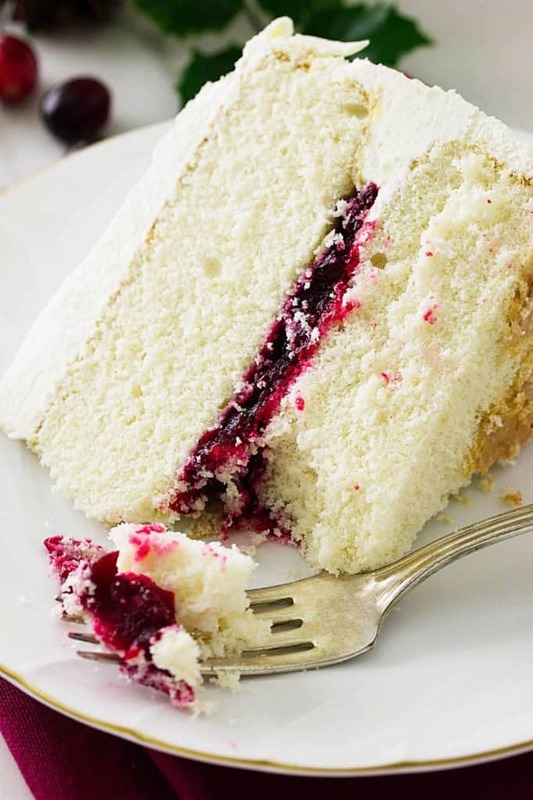 There is a smooth layer of tart cranberry mixture sandwiched right in the middle of two moist vanilla cake layers. Then, the cake is covered with a blanket of ultra-creamy, pure white icing. 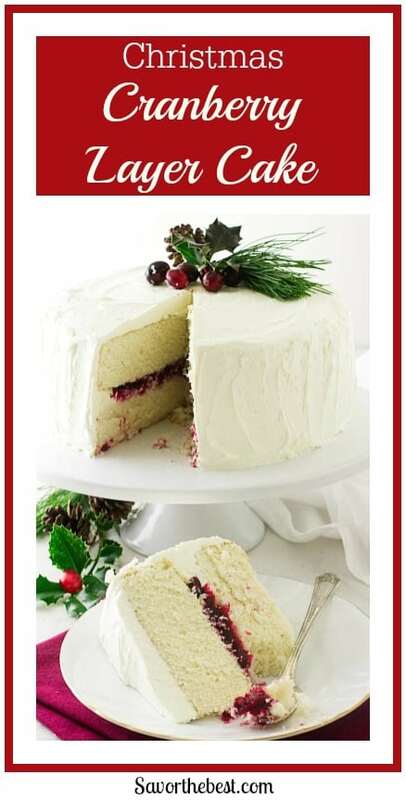 Celebrate the holidays with our Christmas Cranberry Layer Cake! 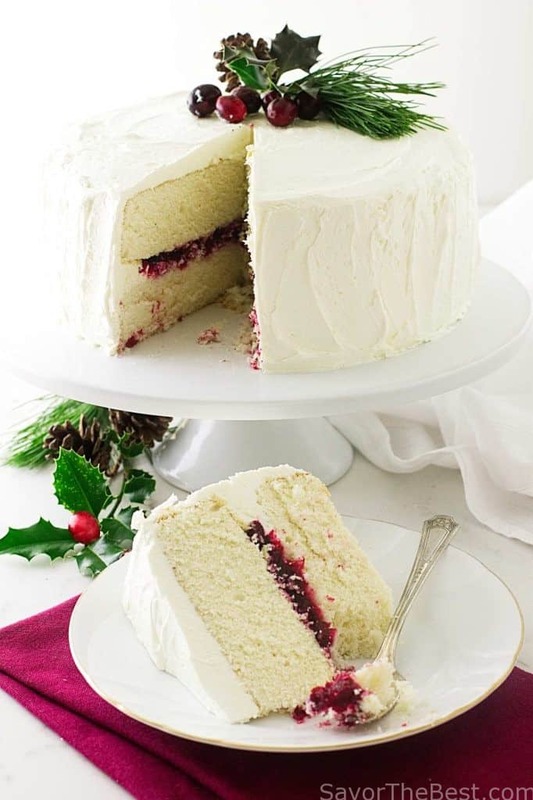 Cranberries are King at the holiday season and we are love’n every bite of our Christmas Cranberry Layer Cake! This delightful cake is all decked out for the holidays and will be a delicious ending for any event at Christmas. The recipe we used for this cake is the same basic recipe as our Lavender cake and it is wonderful! It uses the reverse creaming method which means that there isn’t any creaming of the fats, sugar and eggs. Instead of creaming the butter with the sugar, this method blends the butter with the flour. The liquids and eggs are blended in last. The reverse creaming method helps minimize the formation of gluten and produces a light, moist cake with a tender crumb. Sugar and water are simmered with fresh cranberries until they burst and the sauce thickens slightly. Vanilla, lemon oil and a dab of butter enhance the flavor. Cranberries have a lot of natural pectin which causes the mixture to thicken. The edge of the cake gets a barrier or dam of buttercream before adding the cranberry filling. The dam of buttercream will prevent the cranberry filling from spilling over the edge of the cake. This is an essential step to keeping the layer cake intact. Cranberries are evergreen shrubs, grown on woody vines. Contrary to popular belief, cranberries do not grow in bogs of water. Farmers do not flood the cranberry plants until it is time to harvest them. Blueberries and huckleberries are related to the cranberry. October, November and December is when cranberries are harvested. The secret to this buttercream icing is boiling water! There is a secret to this buttercream icing. 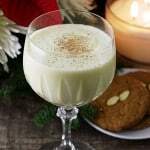 It uses just four ordinary ingredients and transforms them into something extraordinary. Yes, you read that right! Boiling water is poured over confectioner’s sugar while the mixer is running on low. The sugar dissolves into a thick, smooth mixture. During this initial slow mixing the sugar/water gradually cools, then the flavoring and butter are added and it is mixed for another ten minutes. As it mixes it builds in volume to produce this velvety, smooth icing. I kid you not! Our buttercream icing is beyond awesome. This is the lightest, fluffiest and smoothest buttercream icing I have ever tasted! I’m talking true love here! You have got to try this buttercream! There is no greasy mouth-feel, no gritty sugar and it is not a bit over-sweet. It is as smooth as meringue. And, it is so easy! I promise…. you will never, ever make the traditional American buttercream icing again! Everything about this cake is special! The moist, tender crumb of the vanilla flavored white cake, the thick layer of tart cranberries and that wonderful awesome buttercream icing! 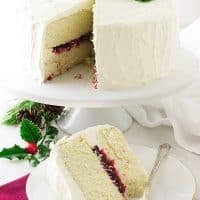 You will not go wrong by adding this Christmas Cranberry Layer Cake to your Christmas dessert menu. Celebrate the holidays with our Christmas Cranberry Layer Cake! There is a smooth layer of tart cranberries sandwiched right in the middle of two moist vanilla cakes. 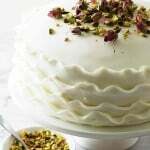 The cake is covered with a delicious blanket of ultra-creamy, pure white buttercream. Prepare two 9”x 2” round pans by lining them with parchment paper. Mix the dry ingredients on slow speed for 2 minutes to blend. Add the soft butter and beat on medium speed until it looks like damp sand. Add the egg whites one at a time, then add the whole egg, beating well after each addition. This will help build the structure of the cake. In a small bowl, whisk the milk with the vanilla and almond extract and add it 1/3 at a time, to the batter. Mix just until combined. Scrape down the sides and bottom of the bowl. 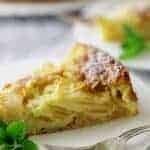 Pour the batter into the prepared pans and bake for 23 to 28 minutes or until a toothpick inserted into the center comes out with just a few crumbs stuck to the toothpick. Remove from the oven and cool completely on a wire rack. To a small saucepan set over medium heat, add the cranberries, sugar water and salt. Bring to a boil and cook, stirring frequently until the berries have burst. Reduce heat to low and simmer for 8-10 minutes. Remove from heat and stir in the vanilla, lemon oil and butter. Allow to cool. Transfer to the food processor and pulse until the berries are slightly broken. Do not over-mix the berries or they will turn into a puree. Add the confectioners' sugar to the mixing bowl of a electric stand mixer fitted with the paddle attachment. *(See Notes) While the mixer is running, slowly pour the boiling water down the inside of the bowl in a steady stream. Gradually, increase the speed to medium, stopping occasionally to scrap down the sides of the bowl. Beat until the sugar dissolves and the mixture is smooth and has cooled down to room temperature. This will take about 4 minutes. Add the extracts and mix until it is well blended. Add chunks of butter while the mixer is running and beat on low speed. Stop the mixer occasionally and scrape down sides of the bowl. Beat the buttercream until it is smooth and creamy until creamy, about 2-3 minutes. Gradually increase mixer speed to medium *(See Notes) and continue beating until light and fluffy. Stop the mixer occasionally to scrape down the sides of the bowl, about 10 minutes. Slice off any dome on the cake to level. Place one cake layer on a cake stand and arrange parchment strips to keep your cake plate clean while icing the cake. Spread or pipe a rim of the buttercream around the edge of the first cake layer. This creates a dam and prevents the cranberry filling from flowing over the edge of the cake. Spoon the cranberry mixture into the center of the cake and spread it to the inside edge of the dam. Place the next cake layer on the filling, bottom side facing up, and anchor by pressing down slightly. Remove the cake from the freezer and cover the top of the cake with a thick coat of icing. Next cover the sides, using small amounts of icing for better control, and smoothing evenly to finish the effect. Remove the parchment strips and decorate the top according to your preference. Using all butter will give an off-white, cream-color to the finished icing. I used Wilton's Liquid White-White food coloring to make our pure-white icing. Use a hand-held mixer if the stand mixer is not available. Mixing the icing on high speeds will incorporate air bubbles so don't turn it any higher than medium. A thin layer of icing will prevent any crumbs from lifting and marring the finished icing. If you plan to pipe the icing you will want to use 2 tablespoons less water in the initial mixing. A sweet-tart layer of cranberries sandwiched between moist layers of vanilla cake and covered with an awesome buttercream icing! BUT you don’t have almond extract in the ingredient list for the CAKE. Ah ha….good catch, Monika, thanks…. It has been fixed. I appreciate your feedback. Happy New Year! OK … another question. Last one! I want to serve this cake on Friday. If I make the buttercream…best to keep it at room temperature? Once it’s done…how many cups did you use? Did the 1 1/2 cups fresh + the ingredients reduce to 1 cup? Oh! And one more question…If I wanted to make this using three 6-inch pans, would that work? How long would I bake them? Monika you will want to use about 1 1/4 cups of your cranberry jam for the filling. You can use three 6- inch pans for this recipe. You should have a cup or two of batter left over but you can make a couple of cupcakes with the leftover batter. You will want to reduce the baking time of the 6 inch pans by a couple of minutes. It usually takes between 22 to 25 minutes to bake a 6-inch cake. Thank you for replying so quickly. You’re so knowledgeable! This looks terrific! 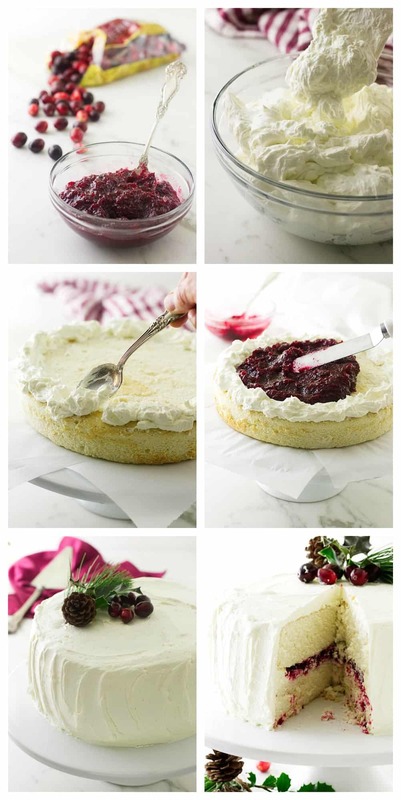 Neat way to use cranberries — this cake looks so festive. Thanks! And Happy Holidays!